The aims of this paper are to offer a brief historical account of book fairs in Catalonia based on a review of documentary materials and to provide a broad outline of their variety and typology. The proposed classification is predicated on previous studies that have addressed the characteristics that identify different types of book fair. The results show some degree of proliferation in book fairs in recent years, reflecting an attempt to develop them as tools for economic and cultural promotion. Barcelona is the host city of a large number of the events, but they also take place in 16 other comarcas, or districts, of Catalonia. The vast majority have a regional geographical scope and are intended for the general public. Although there is a diversity of products across the fairs, the predominant focus is on new books generally, not specific subject matter. In terms of the management of the book fairs, cultural institutions are the leading group, but it is also common to find book-related guilds and public administrations in charge of the events. L'article pretén recollir una breu notícia històrica de les fires de llibres a Catalunya a partir d'una revisió de material hemerogràfic, i, presentar un esbós sobre la varietat i tipologia d'aquest tipus d'activitats a Catalunya. La classificació proposada es fonamenta en alguns treballs anteriors que han incidit en les característiques que identifiquen diferents tipus de fires de llibres. Els resultats mostren una certa proliferació de fires els darrers anys tot cercant convertir-se en una eina de promoció econòmica i cultural. Barcelona en reuneix una bona part, però se'n troben també en 16 comarques més. La immensa majoria tenen un àmbit geogràfic regional i van dirigides a un públic general. Malgrat que hi ha diversitat quant al producte que s'ofereix, predominen els llibres nous no centrats en una temàtica específica. Pel que fa a la responsabilitat gestora, les entitats culturals són les que més fires organitzen, però també és freqüent que la gestió correspongui a gremis vinculats al llibre i a administracions públiques. El artículo pretende recoger una breve noticia histórica sobre las ferias de libros en Cataluña a partir de una revisión de material hemerográfico, y, presentar un boceto sobre la variedad y tipología de este tipo de actividades en Cataluña. La clasificación propuesta se fundamenta en algunos trabajos anteriores que han incidido en las características que identifican diferentes tipos de ferias de libros. Los resultados muestran cierta proliferación de ferias en los últimos años buscando convertirse en una herramienta de promoción económica y cultural. Barcelona reúne buena parte de ellas, pero también se encuentran en 16 comarcas más. La mayoría tiene un ámbito geográfico regional y van dirigidas a un público general. Pese a la diversidad del producto que se ofrece, predominan los libros nuevos sin centrarse en una temática específica. En cuanto a la responsabilidad gestora, las entidades culturales son las que más ferias organizan, pero también es frecuente que la gestión corresponda a gremios vinculados al libro y a administraciones públicas. Book fairs are a promotional tool for the book as a cultural product, which seeks to improve the promotion of reading, help democratize knowledge and promote the economy of the sector. These events are firmly rooted in our country, as evidenced by the volume and variety of the existing ones and the long existence of some of them. However, there are no studies that have addressed the issue in a specific way. With regards to the history of these fairs in the country we find fragments and references to the works of Ainaud de Lasarte (1976), Cendán Pazos (1989) and Martínez Rus (2001; 2003; 2013), as well as in the written press. Additionally, you can add books dedicated to evoking the Diada de Sant Jordi (Saint George's Day) that include references to the activity around the sale of books, as is the case of Entre llibres i roses, by Màrius Carol (1996). A few years before, Joan Crexell (1990) had documented this activity during the last civil war from the press of the time in his study of the book in Catalonia during the fight. In this sense, this article contains a brief historical story to present then a first outline about the variety and typology of this type of activity in Catalonia, classification based on some modern works that have affected the characteristics that identify different types of book fairs. Thus, Rivaud and Kloss (2000) analysed the differences between the professional fairs and those of the general public —named popular by the authors—, indicating that while the former focus on the contact between the economic agents involved, the latter have a function of exhibition and sale to the public, adopting a role closer to that of a conventional bookstore. Moeran (2010; 2011), on the other hand, has studied from the anthropological perspective the actors and transactions involved. One of the characteristics that stands out from the value chain is the segmentation of the market that is expressed in fairs. This segmentation is given by the type of product —giving like examples books for children or travel books—; and, with regards to the target audience, distinguishing between academic, commercial, antiquarian, students, etc. Uribe Schroeder (2012) directly classifies book fairs in three main categories, mixing the geographic reach (international and national or local) and the objectives of the fair. For its part, López Villalobos (2014) classifies them in public, private or alternative, taking into account whether the main profitability is political, economic or social. However, apparently there is no generally accepted classification system for book fairs. From a functional point, a book fair can be defined as a cultural event limited in time and the space that constitutes a meeting point between the offer of producers and distributors of editorial products and the demand of intermediate or final buyers (Ramírez Alvarado, 2015). The first commercial fairs with the book as a predominant product emerged at the end of the 15th century, motivated by the recent appearance of the printing press and as a response to the growth of book business and commodification across Europe. These fairs became great events where, on a regular basis, booksellers, publishers and printers were assembled with the aim of acquiring material, exchanging views or dealing with economic issues and settling debts. As a result of this phenomenon some commercial scenarios became sites of reference. This is the case of the fairs of Frankfurt, currently the most important fair for exhibitors and visitors, Leipzig, Lyon and Medina del Campo (Rivaud; Kloss, 2000; Weidhaas; Gossage, 2007). In Catalonia, the first event devoted to the marketing of books should be placed in 1926, when the "Festival of the Spanish Book" (Fiesta del Libro Español) was instituted in the Spanish state, because of the efforts made by the Valencian writer and editor settled in Barcelona Vicent Clavel Andrés. The date of celebration was set at the Cervantes' birthdate, on October 7th and the day of exaltation and dissemination of the book —exclusively in Spanish— was entrusted to its sale to the street, with the discount of 10 %. In 1929, the Barcelona World Fair gave a positive impact on street activity during the Dia del Llibre (Book’s Day) (Carol, 1996, p.79). In 1930 it was moved to be held on April 23, the date of the death of Cervantes, to move away from the school text purchases in September and, since it should coincide with the spring, could be brought to a more favourable time for outdoor activities.2 However, in Catalonia it had the peculiarity of coinciding with Sant Jordi. The festival will achieve a remarkable success in Barcelona favoured by the publication of several Catalan literary novelties of great popular acceptance.3 It is at this moment when the custom of the signing acts of copies by the authors is established. With the coming of the Second Spanish Republic, the festival takes a more popular as well as commercial character with street bookshops of all types and circulars of the Official Book Chamber to booksellers and teachers, inviting them to celebrate the Book’s Day. The activity begins to spread to other municipalities such as Badalona, ​​Girona or Sabadell (Ainaud de Lasarte, 1976; Cendán Pazos, 1989). As a result of military hostilities, the acquisition of books to be sent to the front was added to the usual motivations to encourage the purchase of books ("En la feria del libro", 1937; Crexell, 1990, p. 10–11). In fact, there is still a poster of the event with the slogan "Book Fair: 3, 4 and 5 June: each citizen a book for the brothers on the front" (Fira del llibre: 3, 4 i 5 juny: cada ciutadà un llibre pels germans del front).5 The book fair of 1937 is the first of these types of activities that we have records in Catalonia. On the other hand, during the war, conferences and radio programs —especially readings—acquired an important role. In 1938, the event was marked by a greater austerity and a logical reduction of the publishing novelties.6 The war situation forced to return to the one-day format, on Wednesday, June 15, even though because of the petitions received, the Commission finally extended the sale during the 16th ("El día del libro", 1938). However, the activities extended both in the previous days and in the subsequent ones. In 1939, once the war ended, a week of academic events was restored on the occasion of the Book's Day. In Barcelona, ​​on April 27th, stores were placed in front of some bookshops ("Ante la fiesta del libro", 1939). And instructions were given of which books were to be displayed on the windows (Martínez Rus, 2001). In 1940, after settling on the 23rd for the Festival of the Spanish Book, ten days before the celebration it was changed to Sunday 28th ("La Fiesta del libro plazada", 1940). And on the 26th it was changed again until May 2nd, coinciding at the same time with a festival of Spanish patriotic exaltation and a religious one ("Ayer", 1940; "La fiesta de la independencia", 1940). In the year 1941 is set for April 24th ("El próximo día 24... ", 1941). In 1942, the Fair will be in discussion again and bookshops will be mounted on May 2nd, 3rd and 4th, although the discount can only be applied on the first day ("La Feria del libro", 1942). In 1945 the Book’s Day finally returned to Sant Jordi's Day, however, at the request of booksellers, it was extended until 25th ("Ayer se celebró...", 1945). In 1946 there was a first attempt to organize a book fair, but the event was not very successful ("La 'i Feria del Libro de Barcelona'…", 1977). The suffocating economic conditions, the shortage of paper and censorship made these efforts useless, which did not really begin to take off until the 1950s. In this context, on September 20th, 1951, the Fira del Llibre d'Ocasió Antic i Modern (the Old and Modern second-hand Book Fair) was born. Initially designed as a specific act of that year during the Mercè celebrations (Barcelona local festival), it soon consolidated itself as a significant cultural event in the city (Elisabet Parra Comunicació, 2014). This is how the dean of the book fairs of the Catalonia has reached the 66th edition in 2017. Regarding the new book, in 1977, booksellers and publishers organized the i Fira del llibre de Barcelona (1st Barcelona Book Fair), which was held from June 10th to 19th in the Passeig de Gràcia.7 The purpose of the fair, expressed by the organizers, was to facilitate the visibility of the publishing collections in a way that different cultural and social sectors could intervene, expanding the possibility of the Book’s Day ("La 'i Feria del Libro de Barcelona'…", 1977). The fair was held in operation at more or less similar dates, reaching the 200 exhibitors on the top moment, until the year 1998 it took place at the beginning of July in Moll de la Fusta (Barranco, 1998). The little success of the new location meant that it returned the next edition to Passeig de Gracia and to more usual dates (Vila-Sanjuán, 1999). In the year 2001 the xxv edition was celebrated, with the announcement that under a new model it would move to the exhibition ground of Montjuïc (Beltran, 2001), as an attempt to attract more public. However, it was not until 2005 that it reappeared, now as the i Saló del Llibre (First Book Show) between November 8th and 13th. The low support of the public and of the publishing world itself did that the last edition was celebrated in 2007 ("El Saló del Llibre deja de celebrarse", 2008). In parallel with the Book Fair of Barcelona, ​​and with new political and economic conditions, more contests have appeared. According to cultural importance, we should highlight the Setmana del Llibre en Català (Catalan Book Week), organized by the Catalan publishers’ association (Associació d’Editors en Llengua Catalana), an entity created in 1978, which brings together publishing companies from the Catalan Countries that publish in Catalan. The first edition of the Setmana was held in 1983 from February 18th to 27th in Barcelona’s Sants railway station. In 1989 it was moved to the França’s railway station and the following year to Barcelona’s former shipyard, Drassanes. In 1999, the 17th edition was held simultaneously in Girona, Palma (Majorca), Perpignan (France) and Tarragona in order to expand its scope. In 2002, it was also held in New York, with different international projection events such as the presentation of the Verdaguer's Year to the members of Casal Català in New York and the formal opening of an exhibition on Gaudí books at the Cervantes Institute of this city, by the Catalonian Publisher’s Association. In the year 2009 the Setmana was based in Sant Cugat, in a context of crisis of the organizational model. In 2010, it returned to Barcelona, ​​at the Parc de la Ciutadella, but with celebrations also in Sant Cugat and Lleida, with a significant change in dates, from being celebrated in February or March to the first fortnight of September, linking since then with the Diada de Catalunya (National Catalonia’s Day). The 2012 edition was moved to Catedral Avenue, where it received an attendance of 100,000 people that has not yet been surpassed. In fact, attracting the general public, and especially the young person, is one of the great challenges of the Setmana. For this reason, in addition to the logical presentations of books and authors' signatures during the 10 days that it lasts, several activities are programmed as live broadcasts of radio and television, children's shows, round tables, literary itineraries, workshops, recitals of works and press conferences. The Premi Trajectòria (Career Prize), which has been awarded since 1997 to a character who has stood out for his activity in favour of the national culture, is also given. ("Confirmat l’èxit…", 1984; La Setmana del Llibre en Català, 2011; ACN, 2012; Albet Guinart, 2015; Juanico, 2017). From the point of the volume of visitors we have to refer to the Saló Internacional del Còmic (Barcelona International Comic Fair) that in 2017 reached the record number of 118,000 visitors, arriving to hang the notice of completely sold out tickets ("El Saló del Còmic consolida…", 2017). This Fair offers several prizes and a lot of activities, which has helped it to become a reference Fair. The first edition of this annual event was hold in 1981 with the name of Saló del Còmic i de la Il·lustració de Barcelona (Fair of the Comic and of the Illustration of Barcelona) and took place between Wednesday 27th and Sunday 31st of May at the Fira de Barcelona as a necessity from the professional sector of comics to claim and promote the illustrated narrative as a means of communication. The differences between the organizers caused almost two fairs to be celebrated with a few days of difference. This duplicity was finally avoided by removing the 1r Saló Internacional del Dibuixant de Còmic i Arts Gràfiques de Sitges (International fair of comic book illustrator and visual arts of Sitges). However, the final agreement involved a certain distribution of activities and exhibitions between Barcelona and Sitges (Ayuso, 1981; Martín, 1981). The 1982 edition was called Saló del Còmic i del Llibre Il·lustrat (Fair of the Comic and of the illustrated Book), returning to Saló del Còmic i la Il·lustració the following year, while holding its venue at the Fair until the 1985 edition. After a two-year term pause for economic reasons, it was organized by the Federació d'Institucions Professionals del Còmic (FICOMIC, Federation of Professional Comic Organizations), taking the current name of the de Saló Internacional del Còmic de Barcelona and moving to the Drassanes where it would remain until the year 1990. Between 1991 and 1993 it moved to the Mercat del Born and during the eleven editions from 1994 to 2004, it was held at the Estació de França. When this transfer took place, the Fair was already fully consolidated and had become a mass phenomenon, having multiplied by four in one decade the 20,000 visitors of 1983. Relocating again the 2005 edition at the Fira de Barcelona, where it continues to celebrate, allowed to overcome the barrier of 100,000 visitors ("Salón del Cómic…", 1982; Vila-Sanjuán, 1988; Vidal-Folch, 1993; Manzano, 1994; "El Saló del Còmic…", 2007). While both in the Setmana del Llibre en Català and Saló del Còmic, although they also have a professional component, much of the role falls on the general public, LIBER, international book fair is the main professional fair on the book and the publishing sector in Europe in the Spanish language, although in the first editions it also had a marketing vocation for the general public, allowing its accessed some days.8 Its main objectives are to promote the export and generate business in this publishing sector. Apart from the stands of publishers and service companies, the event includes many activities such as round tables, professional conferences or readings by renowned authors. The more than 10,000 visitors have several professional profiles such as publishers, booksellers, distributors, authors, graphic and multimedia professionals, professional associations, service and provider companies, librarians and documentalists; and teaching staff. Sponsored by Spain’s Federation of Publishers’ Guilds, it alternates each year between Madrid (IFEMA) and Barcelona (Fira de Barcelona), being held regularly in October. The last edition held in Barcelona was xxxiv in 2016, while in 2017 it has played in Madrid ("LIBER 1984", 1984; Baulenas, 2014; Herranz, 2016; "Liber celebra…", 2017). Books and assimilable materials, due to their dual cultural and economic aspects, have a considerable importance in the structuring of a country and for this reason public administrations tend to promote policies that include aid and subsidies insofar as they can and perceive the importance from the publishing sector in the economy, but also by providing the society with values ​​and knowledge. It is necessary to consider that the fairs, beyond the exhibition and sale of books, have a social side as they are the conferences, debates, workshops, programs of radio and TV; and, of other activities. With regard to professional fairs, they are a good place to gather and relate the different agents involved in the editorial business, establishing contacts, reaching agreements and implementing synergies that have a positive impact on the economic sector, and at the same time, to society as a whole. About the general regulatory framework of fairs, in Catalonia recently it has been regulated by Law 18/2017, of August 1, on trade, services and fairs that, regarding the matter that concerns us here, it has not introduced variations with respect to the previous one of 1994. The current legal norm defines trade fairs such as "commercial events that aim to exhibit goods or offer services to promote their knowledge, innovation and dissemination, promote contacts and commercial exchanges and bring the offer of the various branches of economic activity to demand" (Catalonia, 2017). In addition, they have to fulfil two characteristics: have a limited duration in time and bring together a plurality of exhibitors. However, this regulation only applies to professional fairs, since in the same article explicitly exclude, among others, the markets aimed at the general public with direct sale and withdrawal of merchandise, even if they can receive the traditional denomination of fair. The rest of book fairs are regulated by article 15 that refers to the sale of merchandise and provision of services through structures or detachable positions or street trading vehicles and it is established that it corresponds to the town councils, by means of the municipal ordinances, to authorize them the operation in spaces of public ownership. Book fairs are one more element in the book sector and the book industry. The Department of Culture of the Generalitat de Catalunya (the Government of Catalonia) has been collaborating for years in designing aid policies aimed at the production, promotion and dissemination of both creators and the publishing industry. Awarding of singular grants and subsidies of public concurrence. Collaboration and direct action with entities in the sector to promote support for the promotion abroad through participation in international fairs and events. Facilitating the accessed of companies to international markets. Since 2006, a plan to support the book fairs in Catalonia has also been carried out in order to strengthen the Catalan publishing industry through the collaboration between professionals and the promotion of strategies to bring the book closer to all audiences and to give visibility to the book in Catalan. This Book Fairs Plan places emphasis on the territorial scope, the thematic diversity, the approach to the public and the most appropriate distribution of fairs within the annual calendar. According to data from the Department of Culture, 703,000 euros were awarded as singular grants to different editions of 9 book fairs held in Catalan territory between 2012 and 2014 (Serrano; Verdú, 2015). In 2016 the subsidy was for 6 fairs (and a conference, the Fòrum Edita Barcelona) with a total amount of 245,104 euros (Institut Català d'Empreses Culturals, 2017, p. 58 and 212). Another financial injection that benefits to fairs and libraries is the acquisition of proximity project for purchase at book fairs from the territorial areas of public libraries. The Ministry of Culture encourages public libraries to buy books at fairs and shows in Catalonia. This benefits at the fairs, on the one hand, guaranteeing an additional amount of income, and on the other the libraries, thus they will be able to expand their catalogue and have the publishing news more rapidly than usual. In 2016 it had an amount of 59,000 euros (Generalitat de Catalunya, 2016), while 2017 budgeted 90,000 (Pla de lectura 2020, 2017). In Catalonia, fairs with more trajectory are organized by trade union organizations linked to the publishing and booksellers, a model that prevails in Europe. Therefore, they are their associates who assume the expenses generated by the event, subsidies aside. However, in other countries there are fairs of considerable importance that do not follow this model. For example, in the United States, the American Library Association (ALA) Book Fair is a show organized by the librarian sector in parallel to the annual ALA congress. And in Ibero-America it is more usual that this kind of events are organized by universities, such as the Guadalajara International Book Fair, which was created in 1987 on the initiative of the University of the homonymous city (Ramírez Alvarado, 2015). In our country, in recent years, there have been several fairs in which the driving forces are local public administrations, cultural associations or groups of diverse nature. With respect to the fairs itself, the Catalan Institute of Cultural Companies (ICEC) has been producing a directory with a representative selection of book fairs that are held in Catalonia from 2014 onwards.11 One of the facts that this directory shows is the considerable expansion of fairs throughout the territory, although the distribution is not uniform, nor does the population. Barcelona stands out, of course, but there is also a certain concentration in the counties of Girona and a lower presence in the central and northwest regions. However, the regional dispersal of fairs, the antiquity of some of them and the thematic diversity of these —devoted to the world of comics, poetry, the novel, the mountain book or the second hand/antique book between others— allow us to express that in Catalonia the tradition of the fairs around the book has been rooted. Apart from the Fira del Llibre d'Ocasió Antic i Modern of Barcelona, ​​which, as we have said, is the oldest, there are other well-established ones with more than 30 years of history, such as the case of Saló Internacional del Còmic or La Setmana del Llibre en Català. On the other hand, the proliferation of new fairs is an indicator of the interest they arouse and the utility they offer. In fact, Figure 1 allows you to see how the number of fairs that appeared in recent years has risen rapidly, making it a new economic and cultural promotion tool linked to territories or cultural sectors. However, they also disappear, even some with a long history, as have already been mentioned in the case of the Fira del Llibre de Barcelona (see table 2). Also, during the 2017 the Fira del Llibre Prohibit de Llagostera (Prohibited Book Fair of Llagostera), the first of these characteristics of Europe, neither the Vila del Llibre de Bellprat (Bellprat Book twon) nor the Fira del Llibre de Música i la Partitura (Music books and sheet music Fair) were held, although these two last ones were announced in the directory of the ICEC. There are other fairs all over the territory that are not included in the mentioned directory. It is difficult to carry out a systematic collection.12 Table 1 shows the relation of all those fairs of which we have certainty and that were celebrated in 2017, since all are annual. Apart from this, LIBER is one that alternates between Barcelona and Madrid and that the 2017 edition has taken place in the capital of Spain.13 On the other hand, table 2 includes fairs that have disappeared during the last decade. There is a total of 39 trade fair events. The sorting system in Table 1 and 2 is chronological. It is observed that the period of celebration of events includes from March to December, except for the month of August, coinciding with the most common vacation period. Barcelona has a good number of fairs, given its population weight at the national level (41 % of those held in 2017), but there are fairs in 18 other counties, highlighting the Maresme, which has 3. 3–5 March Barcelona Barcelonès [Col·lectiu GRAF] www. 30 March – 2 April Barcelona Barcelonès Federació d'Institucions Professionals del Còmic www. 2 April Balaguer Noguera Biblioteca Margarida de Montferrat; Ajuntament de Balaguer www. 21–23 April Barcelona Barcelonès Raíña Lupa SL; Institut Català d'Empreses Culturals; Arts Santa Mònica www. 2–14 May Mollerussa Pla d'Urgell Consell Català del Llibre Infantil i Juvenil (ClijCAT); Ajuntament de Mollerussa www. 3 May Figueres Alt Empordà Casino Menestral Figuerenc www. 12–14 May Barcelona Barcelonès Editorials Tigre de Paper, Pol·len, Bellaterra i Icària www. 13 May Vilanova i la Geltrú Garraf Associació pel Foment de la Literatura Infantil Judit Sendra García www. 19–20 May Barcelona Barcelonès [Col·lectiu Gutter Fest] www. 21 May Folgueroles Osona Fundació Jacint Verdaguer; Gremi de Llibreters de Vell de Catalunya www. 21 May Medinyà Gironès Associació Fira del Conte (Fins a 2012 COCU, associació cultural) www. 1–3 September Organyà Alt Urgell Ajuntament d'Organyà; Consell Comarcal de l'Alt Urgell; Associació Llibre del Pirineu www. 8–17 September Barcelona Barcelonès Associació d'Editors en Llengua Catalana www. 22 September – 8 October Barcelona Barcelonès Gremi de Llibreters de Vell de Catalunya www. 7–8 October Besalú Garrotxa Liberisliber www. — (2017 Madrid) Barcelona Barcelonès Federació de Gremis d'Editors d'Espanya www. 14–15 October Sant Andreu de Llavaneres Maresme Associació El Casal de Llavaneres elcasal. 12–15 October Girona Gironès Iniciatives Catalanes i Serveis SL (Incatis) www. 21 October Tordera Maresme Ajuntament de Tordera www. 21–22 October Cervera Segarra Vila del Llibre; Ajuntament de Cervera www. 1–5 November Barcelona Barcelonès Federació d'Institucions Professionals del Còmic www. 3–5 November Vic Osona Ajuntament de Vic; Ajuntament de l'Esquirol; Ajuntament de Rupit; Ajuntament de Tavertet; Associació d'Editors en Llengua Catalana www. 9, 16, 23 i 29 November Barcelona Barcelonès Associació Mozaika www. 2 December Barcelona Barcelonès Club Català de Cultura, SL www. 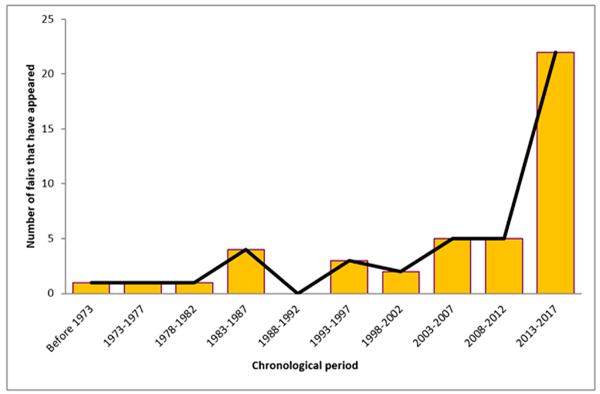 Figure 2 shows the frequency distribution of the antiquity of fairs that were held in 2017 in Catalonia. 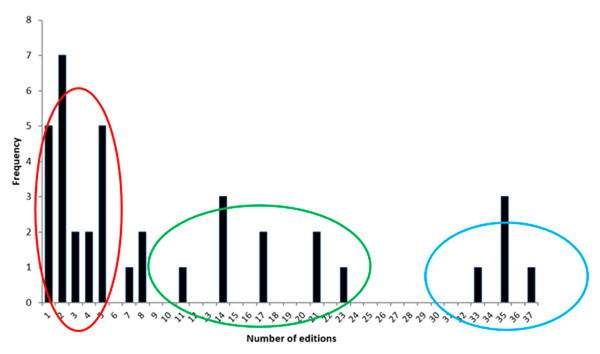 Broadly speaking, there are three groups: those recently started or with few editions, marked with a red oval shape; those that already have a well consolidated path (in green); and those that have been done for more than three decades (in blue), which includes the dean, the Old Book Fair, although it does not appear reflected in the graph. In order to describe the different types of fairs and in the absence of a canonical or standard classification, a scheme that considers four dimensions and that tries to collect the aspects analysed by several specialists already mentioned has been chosen (Rivaud; Kloss, 2010; Moeran, 2010, 2011; Uribe Schroeder, 2012; López Villalobos, 2014). Geographic reach. In this case, the category can take two values: international or regional, taking into account the projection and geographical origin of the majority of the actors involved. Another category could still be differentiated, but it is often difficult to discriminate clearly between regional and local. Target audience. Professional or general. Of course, a fair can be aimed at both types of audiences, sometimes on different dates or times. Product. Here the values ​​that the variable that represents the dimension can take on a wide range of factors, given consideration to gender and subject matter (graphic novel, poetry, feminism ...), form and support (artistic, paper, book electronic ...), the commercial origin (new, of occasion), the antiquity, the form of production (industrial, self-publishing, artisan), etc. Management responsibility. This dimension responds to discriminate the different organizational profiles, promoters, beyond the economic supports that can be received. In this case they can be found responsible: to public administrations; trade union organizations and professional associations related to the book; independent publishers; bookshops in an independent way; companies that organize cultural activities; cultural entities (associations and foundations); and, finally, collectives of people without legal ties, but with specific joint interests. In accordance with these four dimensions, table 3 exemplifies the use of book fairs in Catalonia, both those that have had activity during 2017 and the disappeared ones. Overall, the clear majority have —or have had— a regional geographic scope and are aimed at a general public. 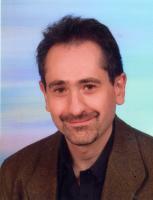 Regarding the product, there is a great diversity, depending on the aspect observed. If we look at the commercial origin, the new book clearly prevails (72.7 %), 11.4 % offer only old or second-hand books and the rest admit all variants. 25 % of fairs have a specific thematic orientation, while the rest tend to be generic. In 18.2 % of cases they correspond to specific literary genres or subgenres (poetry, graphic novel and historical novel). And 11.4 % of the fairs present a product aimed at an audience of a specific age group (children's and youngster's books). Regarding the managerial responsibility, the presence of cultural entities predominates (see table 4), especially of cultural associations.14 It is also common that management corresponds to the guilds of publishers, booksellers or distributors. As is logical, especially in small populations, public administrations are also frequent. However, this global volume has an uneven distribution depending on the type of management. 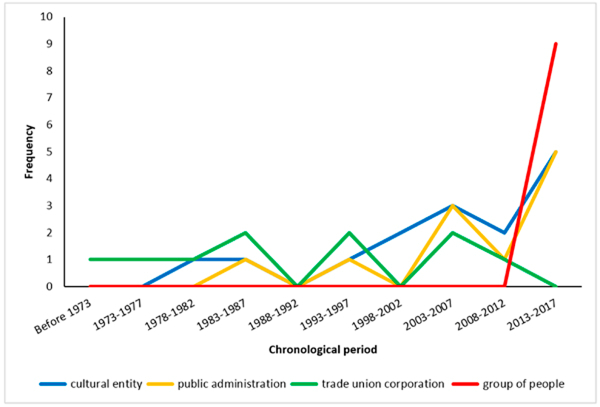 In fact, as shown in Figure 3, the presence of management groups is recent. In Catalonia, book fairs at this time are a type of event seen with cultural value and a significant economic impact, either direct or indirect, as evidenced by the expansion in recent years of these types of fairs promoted by different agents. With regard to the direct impact, the importance must be relativized if we have to pay attention to the figures in the report Hàbits de lectura i compra de llibres a Catalunya (Reading and buying book habits in Catalonia) corresponding to the year 2016 (Institut Català de les Empreses Culturals, 2017a) because the fairs occupy the 5th place in the purchase of non-text books in a population of more than 14 years, with a percentage of 7.6 %, not much different from the situation in previous years. But the number considers jointly Saint George’s Day and the various fairs. And last year we read in the press the percentage importance regarding the total annual sales granted by the Booksellers Guild to sales of Sant Jordi's, with current figures of around 7 %.15 However, several fairs in small municipalities or places that are relatively remote of Barcelona and the major Catalan urban centres seek to indirectly attract foreign population to the locality where is carried out and boosting the local economy through the consumption of the services offered during the event or Later, thanks to the tourist promotion that the fair can mean. From a global perspective, some fairs have years of history and have been able to deal with mishaps of various factors. One of the significant points for its survival is the degree of specialization with regard to the product. They offer the public the opportunity to know and accessed an extensive volume of production on a specific topic, territory or format. This is the case, for example, of the Fira del Llibre Ebrenc (Book Fair of the Ebre lands) that brings together the production, edition, the actors that promote, sell and read books made by authors or organizations from the lands of the river Ebre or are of the thematic about these counties. Other fairs, such as the Literal, help raise the critical spirit of society with the combination of the sale of social science books and the organization of talks by activist people. The fairs organized by alternative groups offer the public the opportunity to know products that are difficult to accessed precisely because they find themselves outside the conventional trade channels. Although the main attraction of these fairs continues to be books and other documents on paper, they are not the only form of cultural transfer that our society has. In this sense fairs are forced to integrate other technological elements. The possible generalization of the use of the electronic book, or at least an use massive enough, can force a significant readjustment of the fairs, since otherwise they could be reduced to events for collectors and nostalgic people. ACN (2012). "L'interès pels títols sobre la història de Catalunya creix a la Setmana del Llibre en Català”. Ara (September 16). <https://www.ara.cat/suplements/llegim/Setmana_del_Llibre_en_Catala-Diada_0_775122665.html>. [Accessed: 14/11/2017]. Ainaud de Lasarte, Josep. M. (1976). Els cinquanta anys del Dia del Llibre. Barcelona: Gremi d'Editors. "Ante la Fiesta del libro" (1939). La Vanguardia (April 22), p. 12. "Ayer" (1940). La Vanguardia (April 27), p. 5. "Ayer se celebró en toda España la 'Fiesta del libro'" (1945). La Vanguardia (April 24), p. 9. Ayuso, Mariano (1981). "La feria de las vanidades". Sunday Comics. Revista sobre estudios e investigación de la historieta, n.º 9, p. 63. Barranco, Justo (1998). "Mejor en sábado. La Fira del Llibre arranca con dificultad". La Vanguardia (July 5), p. 56. Baulenas, Lluís A. (2014). "Liber 2014, moral alta en temps de pirates". Ara (October 11). <https://llegim.ara.cat/Liber-moral-alta-temps-pirates_0_1228077226.html>. [Accessed: 12/10/2017]. Bazán Babczonek, Joanna (2017). IPA Global Book Fair Report 2017. [Ginebra]: International Publishers Association. <https://www.internationalpublishers.org/images/industry-news/2017/IPA_Global_Book_Fair_Report_2017.pdf>. [Accessed: 12/10/2017]. Beltran, Mercè (2001). "Un paseo lleno de libros". La Vanguardia (June 8), p. 51. Carol, Màrius (1996). Entre llibres i roses: setanta anys d’una festa ciutadana. Barcelona: Magrana; Federación de Gremios de Editores de Espanya. Catalonia (2017). "Llei 18/2017, d'1 d'agost, de comerç, serveis i fires". DOGC, núm. 7.426, 3 d'agost de 2017. <http://portaljuridic.gencat.cat/ca/pjur_ocults/pjur_resultats_fitxa/?action=fitxa&mode=single&documentId=794501&language=ca_ES>. [Accessed: 12/10/2017]. Cendán Pazos, Fernando. (1989). La Fiesta del Libro en España: crónica y miscelánea. Madrid: Fundación Germán Sánchez Ruipérez; Pirámide. "Confirmat l’èxit popular de la Setmana del Llibre" (1984). Avui (March 13), p. 26. Crexell, Joan. El llibre a Catalunya durant la Guerra Civil. Barcelona: Publicacions de l’Abadia de Montserrat. Dujovne, Alejandro; Sorá, Gustavo (2010). "Un hecho de política cultural: Argentina en la República Mundial de la Edición". A: Fallace, Magdalena (coord.). Feria del Libro de Frankfurt. Argentina, País invitado de honor 2010. Buenos Aires: Ministerio de relaciones exteriores, comercio internacional y culto, p. 217–223. "El día del libro" (1938). La Vanguardia (June 16), [graphic supplement, p. 2–3]. "El próximo día 24 se celebrará la Fiesta del libro" (1941). La Vanguardia (April 4), p. 2. "El LIBER busca empènyer la venda de llibres" (2014). Barcelona.cat. Barcelona: Ajuntament de Barcelona. <http://ajuntament.barcelona.cat/barcelonallibres/ca/noticia/el-liber-busca-empzunyer-la-venda-de-llibres#.WtH3jGuIC9I>. [Accessed: 12/10/2017]. "El Saló del Còmic alcanza por primera vez los 100.000 visitantes" (2007). La Vanguardia (April 23), p. 41. "El Saló del Còmic consolida el seu rècord de visitants" (2017). El Punt Avui (April 2). <http://www.elpuntavui.cat/cultura/article/19-cultura/1109932-el-salo-del-comic-consolida-el-seu-record-de-visitants.html>. [Accessed: 12/10/2017]. "El Saló del Llibre deja de celebrarse" (2008). La Vanguardia (May 10), p. 40. Elisabet Parra Comunicació (2014). 64a Fira del Llibre d'Ocasió, Antic i Modern. Dossier de premsa. <https://elisabetparracomunicacion.files.wordpress.com/2014/09/140919-dp-fira-del-llibre-docasic3b3.pdf>. [Accessed: 12/10/2017]. "En la feria del libro" (1937). La Vanguardia (June 3), [graphic supplement, p. 2–3]. Generalitat de Catalunya. Departament de cultura. (1936). "Decret [de 26 d’agost de 1936] per a estructurar, unificant-lo, el règim editorial de Catalunya i fer que responguin al nou esperit; per a resoldre el problema social gravíssim que planteja l’absoluta paralització dels afers editorials, impressors, relligadors, enquadernadors, repartidors, comissionistes, viatjans, cobradors i personal adminsitratiu". DOGC, núm. 241, 29 agost 1936, p. 1228. <http://dogc.gencat.cat/web/.content/continguts/serveis/republica/1936/19360241.pdf>. [Accessed: 11/11/2018]. Generalitat de Catalunya (2016). "Llibres per a les biblioteques públiques". <http://web.gencat.cat/ca/actualitat/detall/Llibres-per-a-les-biblioteques-publiques> [Accessed: 12/10/2017]. Herranz, Maria Dolors (2016). "Fira de Barcelona organitza a l'octubre Liber, la major trobada del llibre en espanyol". Liber.es. Barcelona: Fira de Barcelona, March 31. <http://www.liber.es/ca/notas-de-prensa/-/prensa/detalle/7054921/np-liber-2016>. [Accessed: 12/10/2017]. Institut Català de les Empreses Culturals (2016). Memòria de l'Institut Català de les Empreses Culturals 2015. Barcelona: Generalitat de Catalunya. Departament de Cultura. Institut Català de les Empreses Culturals (ICEC). <https://issuu.com/icec_generalitat/docs/160628_memo__ria>. [Accessed: 12/10/2017]. — (2017a). Hàbits de lectura i compra de llibres a Catalunya Informe de resultats 2016. Barcelona: Generalitat de Catalunya. Departament de Cultura. Institut Català de les Empreses Culturals (ICEC). <https://issuu.com/icec_generalitat/docs/ha__bits_de_lectura_i_compra_de_lli>. [Accessed: 12/10/2017]. — (2017b). Memòria de l'Institut Català de les Empreses Culturals 2016. Barcelona: Generalitat de Catalunya. Departament de Cultura. Institut Català de les Empreses Culturals (ICEC). <https://issuu.com/icec_generalitat/docs/memo__ria2016>. [Accessed: 12/10/2017]. Junico, Núria (2017). "La Setmana del Llibre en Català bat rècords de facturació amb un 14% més de vendes que el 2016". Ara (September 19). <https://llegim.ara.cat/actualitat/Setmana-Llibre-Catala-record-facturacio_0_1872412868.html>. [Accessed: 12/10/2017]. "La 'i Feria del Libro de Barcelona' se abrirá el próximo viernes" (1977). La Vanguardia (June 8), p. 33. "La Feria del libro" (1942). La Vanguardia (April 4), p. 3. "La fiesta de la independencia" (1940). La Vanguardia (May 3), p. 1. "La fiesta del 2 de mayo" (1940). La Vanguardia (May 1), p. 4. "La fiesta del libro aplazada" (1940). La Vanguardia (April 19), p. 5. La Setmana del Llibre en Català (2011). Barcelona: Associació d'Editors en Llengua Catalana, actualització 2017. "Història de la Setmana del Llibre en Català". <http://www.lasetmana.cat/qui-som>. [Accessed: 14/11/2017]. La Setmana del llibre en català (2011). Barcelona: Associació d’editors en llengua catalana, actualització 2017. "Història de la setmana del llibre en català". <http://www.lasetmana.cat/qui-som>. [Accessed: 14/11/2017]. "LIBER 1984" (1984). Avui (September 27), p. 24–29. "Liber celebra su 35 aniversario en Madrid" (2017). Ifema.es. Madrid: IFEMA, <http://www.ifema.es/liber_01/InformacionGeneral/Presentacion/index.htm>. [Accessed: 12/10/2017]. López Villalobos, Dayana (2014). "¿Ferias o mercados? Representaciones sobre el libro, la lectura y la escritura en el marco de las ferias del libro". Quórum académico, n.º 11, p. 112–134. Manzano, Emilio (1994). "El Saló del Cómic abre sus puertas en la estación de Franca". La Vanguardia (May 5), p. 41. Martín, Antonio (1981). "Ante el Salón del Cómic y la Ilustración. Un certamen para todos". La Vanguardia (May 27), p. 45. Martínez Rus, Ana (2001). La política del libro sobre la Segunda República: socialización de la lectura. Doctoral thesis. Universidad Complutense de Madrid. <http://www.ucm.es/BUCM/tesis/ghi/ucm-t25567.pdf>. [Accessed: 12/10/2017]. — (2003). "La política del libro y las ferias del libro de Madrid (1901–1936)". Cuadernos de historia contemporánea, vol. 25, p. 217–234. — (2013). "Expolios, hogueras, infiernos. La represión del libro (1936–1951)". Represura, n.º 8. <http://www.represura.es/represura_8_febrero_2013_articulo2.pdf>. [Accessed: 12/10/2017]. Moeran, Brian (2010). "The book fair as a tournament of values". Journal of the Royal Anthropological Institute, vol. 16, no. 1, p. 138–154. — (2011). "The book fair as a tournament of values". In: Moeran, Brian; Strandgaard Pedersen Jesper. (eds.). Negotiating Values in the Creative Industries: Fairs, Festivals and Competitive Events. Cambridge: Cambridge University Press, p. 119–144. Nopca, Jordi (2016). "Les vendes per Sant Jordi creixen un 3 %, i el 54 % són en català". Ara.cat (April 29). <https://www.ara.cat/cultura/vendes-Sant-Jordi-creixen-catala_0_1567643288.html>. [Accessed: 12/10/2017]. Orúe, Eva (2012). "Ferias del libro. El contacto directo con el lector". Delibros, n.º 264, p. 30–33. Palma Martos, María Luisa; Martín Navarro; José Luis (2009). "El mercado del libro en España 1989–2006. Un análisis económico". Estudios de economía aplicada, vol 27, n.º 1, p. 223–250. Pla de lectura 2020 (2017). Vol. 1. Barcelona: Generalitat de Catalunya. <http://www.govern.cat/pres_gov/AppJava/docrel/nota-premsa/contingut/download/217293.htm>. [Accessed: 12/10/2017]. Ramírez Alvarado, María Matilde (2015). "La Feria del Libro y sus funciones". Boletín de la Asociación Andaluza de Bibliotecarios, n.º 109, p. 47–53. Rivaud Morayta, Amelia; Kloss Fernández del Castillo, Gerardo (2000). "De ferias, bibliotecas, pasado, futuro, justicia, democracia y otros temas... Reflexiones sobre una visita a la reunión anual de la American Library Association". Educación y biblioteca, n.º 116, p. 20–26. "Salon del Cómic y del Libro Ilustrado" (1982). La Vanguardia (February 24), p. 26. Serrano, Álvaro; Verdú, Manel (2015). "Pla nacional de lectura 2012–2016". DeCultura, núm. 29. <http://dadesculturals.gencat.cat/web/.content/dades_culturals/09_fulls_decultura/arxius/29_DeCultura_PNL.pdf>. [Accessed: 12/10/2017]. Torner, Carles (2009). "Una diplomàcia cultural paradoxal?". Via. Valors, idees, actituds: revista del Centre d'Estudis Jordi Pujol, núm. 11, p. 119–132. Uribe Schroeder, Richard (2012). "Origen de las ferias del libro". In: Uribe Schroeder, Richard; Zapata López, Fernando; Jaramillo Hoyos, Bernardo; dos Santos Piúba, Fabiano; Torres Cadena, Mónica; Rueda Azcuénaga, Juan Carlos; Boix-García, Marifé; Herrero de Consiglio, Mónica. Las ferias del libro. Manual para expositores y visitantes profesionales. Bogotá: CERLAC, UNESCO, p. 21–31. Vidal-Folch, Ignasi (1993). "'Barcelona ya tiene el salón internacional del cómic más importante del mundo'. Entrevista a Joan Navarro, director del Saló del Còmic de Barcelona i de Glénat". La Vanguardia (April 9), p. 28. Vila-Sanjuán, Sergio (1988). "El Saló Internacional del Còmic acoge en las Drassanes el homenaje del tebeo de Barcelona". La Vanguardia (27 May), p. 67. — (1999). "Latidos de la indústria cultural". La Vanguardia (28 May), p. 3 (books supplement). Villarino Pardo, María del Carmen (2016). "Estrategias y procesos de internacionalización Vender(se) y mostrar(se) en ferias internacionales del libro". In: Galnes Santos, Iolanda; Luna Alonso, Ana; Montero Küpper, Silvia; Fernández Rodríguez, Áurea. La traducción literària. Nuevas investigaciones. Granada: Comares, p. 73–92. Weidhaas, Peter; Gossage, Carolyn (2007). A History of the Frankfurt Book Fair. Toronto: Dundurn Press. 1 However, we should not be forgotten that fairs are also a political tool. For example, the current presence of many countries in international book fairs serves the cultural policy and public diplomacy (Torner, 2009; Dujovne; Sorá, 2010; Villarino Pardo, 2016). 2 Although it seems that in Barcelona that day, rains were frequent, according to complains in La Vanguardia ("En la feria del libro", 1937). 3 For example, the Catalònia Bookshop admitted to having sold about 20,000 volumes, almost half in Catalan. 4 The situation was considered so serious that the Government had to publish a decree of organization and reactivation entrusting the task to the Catalan Writers' Association (Generalitat de Catalunya, Departament de Cultura, 1936). 5 Collection Cartells del Pavelló de la República (UB); C-5370. Digital version available at: <http://mdc.cbuc.cat/cdm/ref/collection/pavellorepu/id/816>. [Access: 12/10/2017]. 6 However, commercial activity seems to have been a success. The best-selling work was Aloma, by Mercè Rodoreda, the Joan Crexells Prize of 1937, with a print run of 4,000 copies (Crexell, 1990, p. 35–36). 7 This was not the first trade union attempt. Three or four years earlier, a fair of these characteristics had already been launched in the Mercat del Born, but without success. 8 In later editions, other resources have been used to bring LIBER closer to the general public. For example, in the 2014 edition the non-professional public could enter from 4 p.m. ("El LIBER busca", 2014). 9 However, it is necessary to clarify that the venue of this fair not have always been in Barcelona or, at least, exclusively. 10 The different weekly markets for collecting or second-hand products can neither be considered a fair, as the Sunday Market of Sant Antoni, in Barcelona, ​​the most emblematic of Catalonia. 11 The different editions are available at: <https://issuu.com/icec_generalitat/stacks/ba2456ba27f645ce9c6add77731e8b60>. [Access: 12/10/2017]. 12 In addition, there are initiatives carried out in specific contexts, such as the Fira del Llibre Prohibit (Forbidden Book Fair) within the Setmana del Llibre Prohibit (Week of the Prohibited Book), in the Mercat del Born of Barcelona (June 7, 2015); and, the Mercat dels Llibres Prohibits (Forbidden Book Market), within the Setmana de la Cultura Prohibida (Forbidden Culture Week), back to Born (May 28 and 29, 2016). 13 The table has not included fairs dedicated basically to the exchange of books and material such as those in Figueres, Palafolls or Castelló d'Empúries, which essentially have another function. For the same reason, these events that are usually carried out around the Sant Jordi’s Day are excluded. 14 It is necessary to consider that sometimes the management responsibility falls on more than one organization, therefore the number of unities of responsibility is higher than that of fairs. 15 See, for example, the article by Jordi Nopca (2016) in the Ara newspaper. Guzmán Luna, Cristina; Ardanuy Baró, Jordi (2018). "Book fairs in Catalonia : historical note and attempt at classification". BiD: textos universitaris de biblioteconomia i documentació, núm. 41 (desembre) . <http://bid.ub.edu/en/41/guzman.htm>. DOI: http://dx.doi.org/10.1344/BiD2018.41.22 [Consulta: 25-04-2019].